When a bench needs to be fastened to concrete, brick or block, there are a number of different considerations to take into account before starting the job. These critical decisions include: selection of the proper type of anchor, anchor material as well as the diameter and length of the anchor. These will impact the success of the fastening application. The first consideration is whether or not the bench will be placed outdoors or indoors. This will include whether or not the environment has moisture or chemicals present. If the bench is outdoors in a moist environment or where chemicals are an issue, then a stainless steel anchor should be used. Anchors made from stainless steel are rust resistant and will retain its appearance and holding values for its lifespan. If the bench is going to be placed indoors and in a dry environment, then a standard zinc plated concrete anchor will work. Many times, benches are placed outdoors using these standard zinc plated anchors and after several years, the fasteners become rusted out. This causes two major problems. 1) The rusted anchors look unattractive 2) their holding values deteriorate. Rusted out concrete anchors are unable to hold the loads originally intended. Another consideration is whether the bench is made from pressure treated wood. 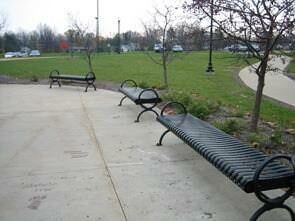 If the bench is, then the anchor will need to be made of stainless steel or hot-dipped galvanized. Standard zinc placed anchors shouldn't be used to fasten pressure treated wood because these will erode quickly. The only way to prevent erosion is to use a stainless steel concrete fastener or to use one that is hot-dipped galvanized. Wedge anchors are the only concrete anchor that is manufactured using this galvanized process. If any other anchor needs to be used, it must be made of stainless steel. If this bench is going to have to be removed and replaced on a regular basis, then a female type anchor should be considered. This type of anchor will allow for a flush surface after the bench is removed and can also be bolted and unbolted as many times as needed without the deterioration of the anchor's holding values. If the bench will remain once put in place, then a wedge anchor should be used. The third consideration when anchoring a bench to concrete is the diameter of anchor that should be used. The larger the bench, the larger the anchor is going to need to be. The main determine factor will be the size of the hole in the footplate of the bench. It is important to note that a 1/2" diameter wedge anchor will not fit into a predrilled hole that is 1/2". The next smaller wedge anchor diameter will need to be used. If female anchors are used, then the hole must be spotted because the designated diameter is equal to the inside diameter of the female anchor. For example, a 3/8" drop in anchor will need a 1/2" hole to be drilled. The base material will also need to be considered. If the bench will be placed on concrete then certain anchors should be used. If the bench is to be placed on a brick surface, the application will require the use of different anchors. It is imperative to determine which type of anchors will work best in the base material at hand. The last consideration is the anchor length that needs to be used. The length of the anchor is determined by the type of anchor used, the diameter of the anchor and the thickness of the material being fastened. Each anchor has a minimum embedment depth for placement of the anchor into the base material that will allow for proper holding values. Wedge anchors are commonly used for fastening benches to concrete. They are available in zinc plated, hot-dipped galvanized and stainless steel. They can be used in both indoor and outdoor applications. If the bench is made from treated lumber, then a wedge anchor can be used. Both stainless steel and hot-dipped galvanized wedge anchors are deemed acceptable for use in treated lumber. Wedge anchors are male type anchors meaning that the threads will be sticking out above the surface of the concrete. The bench can be removed by loosening the nut and lifting the bench over the threaded part of the anchor. If the bench needs to be removed permanently and the hole was drilled 2x the length of the anchor, then the wedge anchor can be pounded into the concrete until level with the surface of the concrete. Wedge anchors have excellent holding values in concrete. The minimum length of the wedge anchor that needs to be used is determined by adding the thickness of the material to be fastened plus the minimum embedment. Sleeve anchors can be used when an application requires that a bench is attached to concrete, brick or block base material. Sleeve anchors are available in zinc plated and stainless steel. Zinc sleeve anchors can be used in indoor applications and stainless steel sleeve anchors can be used in outdoor applications and with treated lumber benches. Sleeve anchors are male type anchors so the stud will protrude above the surface of the base material. Taking the nut and washer off and lifting the bench over the stud will remove the bench. If the bench will need to be removed, drill the hole 2x of the length of the anchor so it can be hammered into the hole in concrete after removal. The length of sleeve anchor needed is determined by adding the thickness of the material to be fastened plus the minimum embedment of the anchor being used. Adding the thickness of the nut and washer is not necessary because the designated length of sleeve anchors are measured from under the nut and washer. Drop-in anchors are commonly used for attaching benches to concrete and for applications when the bench will be removed and replaced repeatedly in the same location. Zinc plated drop in anchors are available for indoor usage and stainless steel anchors are available for outdoor usage. Stainless steel drop-ins can also be used with treated lumber. The bench can easily be moved by removing the bolt that is inserted through the bench and into the drop in anchor. Drop-in anchors have excellent holding values in concrete but are not designed for use in brick or block. The length of the bolt that will be needed can be found by adding the thickness of the material to be fastened to the length of the internal threads of the anchor. Space must be added to this length if any type of washers will be used. Before installing and anchoring a bench to a concrete, brick or block base material- it is essential to consider many things including the environment in which the bench will be placed, the base material and length of anchor needed among others. Before starting your project, taking all of these considerations into account will help the project proceed smoothly and help prevent problems after installation.